Ignition failures, nonfunctioning lights and complete engine breakdowns all can signal problems with a truck’s electrical system. But while most truck technicians know how to measure a truck’s voltage by using a multimeter, scores on a recent assessment of electrical knowledge by American Trucking Associations’ Technology & Maintenance Council suggest their knowledge of electrical troubleshooting often stops there. “The average overall score on our 2018 online electrical knowledge assessment for medium- and heavy-duty truck technicians was 64%,” said Chris DiSantis, director of training and field technical support for Aim NationaLease. “This tells us that when it comes to truck electrical systems, technicians are deficient in analytical skills, interpretation of multimeter readings and solving problems. That’s not what we expected,” said DiSantis, who chairs TMC’s Electrical Study Group. The upshot is that fleets are wasting thousands of dollars because they don’t know enough about truck electrical systems or have the right tools to fix electrical problems, said Bruce Purkey, president of Purkeys Consulting. Years ago, truck electrical systems were limited to batteries, circuits and switches, circuit loads, wires and a ground. “Back then, you could use a regular pair of crimpers to make all your electrical ­repairs,” said Purkey. Today, however, modern truck electrical systems include computers, electronics and multiple sizes of wiring. At the least, technicians now need specialized crimpers to gut splices and connect wires, Purkey said. Tom Hendricks, director of learning and development at UPS Corporate Automotive, said poor wiring connections and breaks caused over time by a taxing duty cycle are the most common electrical problems found in UPS trucks. To repair these issues, all UPS shops are equipped with a certain brand of specialized crimpers, laptop computers and diagnostic software, Hendricks said. UPS Inc. ranks No. 1 on the Transport Topics Top 100 list of for-hire carriers in North America. Corrosion of wires and connectors caused by road salt is the largest electrical problem for trucks today, the industry experts said. Battery issues are next. “The harsh chemicals we put on roads attack truck electrical systems and have a severe corroding effect on electrical harnesses and connectors,” said DiSantis of Aim NationaLease. Homer Hogg, technical service director at TravelCenters of America, said that analyzing the quality and quantity of work at maintenance shops can tell maintenance managers how much their technicians know. Hogg said that overall, analysis of repair data can reveal repetitive repairs and costly part replacements that could have been avoided by doing proper repair the first time. Shops that don’t have systems that can look at repair data and trend it will fall behind, he said. Meanwhile, UPS’ Hendricks said all test lights have been removed from their facilities. The diagnostic laptop has become the primary shop tool, and updated software is essential to proper diagnostics and resolution, he said. UPS’ procedure for troubleshooting truck electrical problems is to use a diagnostic computer for sensor or driveability concerns and a digital volt ohm ­meter to find the exact location of poor connections in the wiring, Hendricks said. “Our policy is to repair as many vehicles as possible internally rather than send them to the dealership for repair,” he said. DWS Fleet Management Services CEO Darry Stuart said many fleets have problems with basic electrical techniques, such as wire clamping and routing. But he sees even more problems stemming from poor battery maintenance. “If fleets would equip their trucks with the number of batteries recommended by the manufacturer and practice good maintenance by cleaning terminals and checking routing for corrosion, they’d eliminate the majority of perceived electrical problems,” he said. Stuart thinks many technicians fear electricity and need training. First, training is needed on the use of multimeters and the care of batteries and then on truck electrical systems generally, he said. But for small fleets in particular, training can be hard to get, Quality Transport Co. President Dave Dettman said. 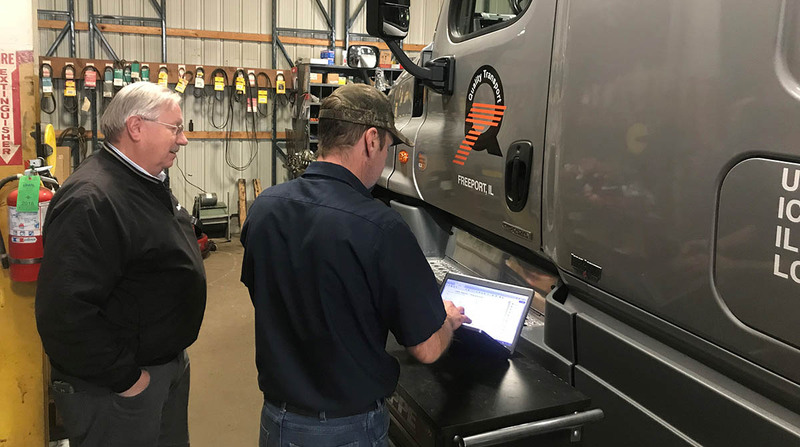 To stay abreast of truck electrical and electronic technology, Dettman downloads the latest technical information from Freightliner and furnishes his technicians with laptops and the same diagnostic programs used by Freightliner dealers. Dettman thinks other small fleets should act similarly to solve their truck electrical problems. “Try to hire the best technicians you can find, provide them with the best tools you can and be willing to give them the training they need, wherever you find it,” he said. Meanwhile, Jack Legler, technical director of TMC, said the council offers more than 50 recommended practices covering various aspects of electrical maintenance and is working on more. An RP on maintaining solar panels on trucks was recently released, and an RP for making ordinary wire and cable repairs is in progress. Also in the works is a revision to an RP, which will reflect the current state of truck electrical systems. “As more devices, power systems and technologies are built into trucks, cutting-edge electrical knowledge and skills will be absolute necessities for technicians to keep fleet equipment operating at peak efficiency,” Legler said. Legler also said technicians will need the expertise to work with multiple voltages. “Twenty-four and 48-volt systems will show up soon in electric heavy-duty trucks,” he said. Martin Singh, vice president of maintenance and procurement at Trans-System Inc., said technicians at his shop needed training on battery care. “Lack of battery maintenance was our fleet’s main electrical problem, so we hired a consultant to come out and train our technicians,” he said. Before the training, Singh said if a driver complained that he needed a jump start or had no start at all, fleet technicians might replace the truck’s entire bank of batteries. “Or, if they couldn’t find the problem, they would just send the truck back out without cleaning the battery terminals or doing anything else, and the truck would break down again,” he said. Will Your Next Truck Be a Plug-In?